Megan Ghallager and Cannon, a half Arabian half Quarter Horse buckskin gelding. Young Megan (from Grass Valley, California!) 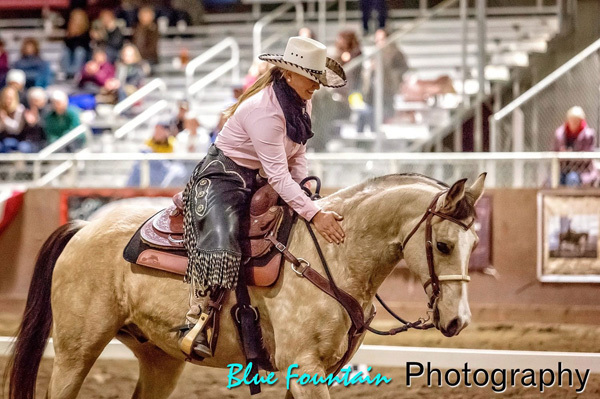 is the winner of the first ever Top Hand Competition at the Cowboy Dressage World Gathering and Finals! 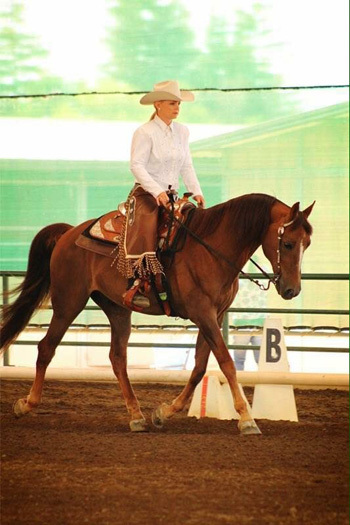 We couldn’t be more proud of her, and ALL the participants in this new addition to Cowboy Dressage. The level of riding, softness and harmony was superb. Congratulations to Megan and to all the riders. Bravo! I chose to enter the Top Hand competition because I love a challenge. I liked the idea of having a mystery test and loved the swapping of horses. After committing to enter, the next thing was to choose a horse. The first one that came to mind ended up being the one I chose, Cannon. He is a half Arab half quarter horse that I had been working with part time for just under 2 years. He had been to a few cowboy Dressage shows and had shown really good progress. We worked 2-3 days a week slowly introducing parts of the challenge court (he had never shown in the challenge tests). Things came pretty easy for him till it came to the simple change at 8. That was really challenging. It was amazing to see how is lope changed the more we worked on it. He became so flexible, I started to feel like I could change the length of his stride to anything I wanted! Before heading to the finals I was feeling great about how much Cannon and I had imported working towards this goal, the rest was just going to be icing on the cake! Our ride on Thursday went well. We didn’t quite get the simple changes we had been at home but that was to be expected. When they announced top 10 Friday I was overwhelmed with excitement to hear our names called! I had had a chance to watch some of the other rides and they were all amazing horsemen and women. After not much sleep Friday night, it was time to start getting ready for the Saturday night festivities. We had received the mystery test about an hour prior to getting on. I felt pretty good about it. It had enough similarities to the first test I felt like we were prepared. All of the riders gathered to be apart of the presentation and entered the arena. Cannon was feeling all the excitement and energy. He hadn’t really been exposed to anything like that before. With the crowd, the music, the announcer it was a little too overwhelming for him to stand still. They announced top 10 and then they announced the top 5. Wow! We did it again! We made it! At that point we had surpassed any expectations and hopes I had had. I drew 3rd ride and I drew Richard Winters horse! I had seen Richard and whiz for a few years at lighthands and always admired what an amazing horse he was. I felt honored to be able to have him as my draw horse. From this point on I had promised myself to just enjoy the experience. Don’t let myself get overwhelmed with nerves, don’t over think it, just ride and enjoy the moment. I can honestly say I did just that! When they started to announce the placings I found myself reflecting on what an amazing experience being apart of Top Hand was. I heard them announce me as the winner and all those emotions took over! I was so excited there were no words to describe the feeling! Those 2 rides from Saturday’s night are something that I will remember the rest of my life. I didn’t know when I entered the competition how I would be effected in so many ways! Winning the Overall High Point Amateur means more to me than anyone can imagine. I started riding in Cowboy Dressage a little over 2 years ago. I was introduced to it by a friend I had met at my barn, Ron Smith. I had just rescued a little mare that hadn’t responded to another type of training that I had taken her to. But this beautiful new way of partnership, softness and Ron, she loved. We tried to attend some of the gatherings and she tried her best, but horse shows just made her so nervous. Last September I had heard from my good friend, Megan Gallagher, that there was a beautiful Morgan that needed a home. His name was Suntime Doc Holiday. I instantly fell in love with this handsome boy. I bought him without even riding. He had the kindest eyes I had seen in a long time and he was a love ( and kind of a clown ) with my kids, a big deal to me. I began taking lessons on “Doc” and quickly realized how special and talented he was. I felt like we were floating. I started to show him this year in Cowboy Dressage Gatherings and I started to see scores I hadn’t seen before. He was made for this. And he was, I found out. He, I discovered, was the son of Holiday Compadre, one of the famous founding sires of Cowboy Dressage. No wonder he was such a natural and enjoyed it so much. Which made it all the more enjoyable for me because I loved it as much as he did. Doc and I started then to make it a game. How high could we make our scores, what new tests could we try? Each time we had more and more fun. This year I set my goals to win the high point amateur award for the finals show. I knew Doc could do it, but could I. The first day I go the look that I know all horse people can relate to, he looked at me as if to say ” Let’s do this, don’t be nervous.” He carried me there. Each test we got higher and higher scores. I could feel we were going to make our goal as Doc turned up the “juice” and floated like never before. The day of the awards show I saw many of my friends and even my son be awarded for their hard work and dedication to the Cowboy Dressage life. I did win my buckle and I was so proud. We had worked for it and Doc took me there. But then an award that I didn’t expect was the Overall High Point Amateur Award. A saddle to match the buckle. A true prize for my wonderful Doc to wear with pride. I started to get very emotional ( which I never do ) and looked at my friends, the ones who introduced this to me and to my horse. It was all because of them that I ever found this wonderful group of people. Cowboy Dressage has become as true way of life for me and my family. My son, Aidan, is working towards his Junior Partnership Championship and my daughter participated this year in lead line. Even my husband, not a horse person, enjoys the friendly people and the comradery. I am so proud of my Suntime Doc Holiday, he is why I love it so much. I owe it mostly to him. 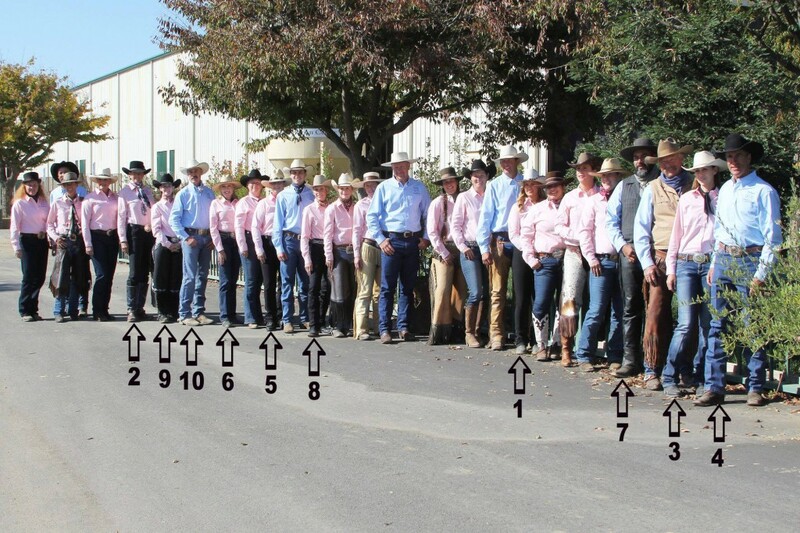 The winners of the first ever Top Hand Competition at the Cowboy Dressage World Gathering and Finals! Top Hand competitors… I solute you! I’ve enjoyed the comments and perspectives from my fellow competitors in Top Hand at the CD Finals. Besides the great horsemanship, I would like to share a few things that stood out for me. First, was the willingness and courage of many accomplished horsemen. The horseman that stepped out of their box (discipline of choice) to compete in Top Hand for their very first CD show. As Richard Winters said, “…this Cowboy Dressage stuff looks a lot easier than it is.” I’ll add a big “Amen” to that! And these horsemen started with jumping in and riding the most challenging test of them all…at their very first Cowboy Dressage show! Well, it was the most challenging test of them all…until we (the top 10) received our mystery test. This test took things up a notch or two. And once more I was impressed by my fellow competitors. There was only one Challenge Court set up for our warm-up. I was so encouraged to see these top competitors being so gracious with their time, definitely sharing the court with others. I think I can speak for all of us and say, we all could’ve spent a lot more time practicing. The third thing that really stood out for me and also embraced the CD philosophy was during the few minutes after we traded horses. These top 5 competitors, who each definitely wanted to win, were coaching and giving tips to the chosen rider of their horse. We only had a few seconds to do this, but I was really moved by my fellow competitors humility and generosity. The CD culture is contagious and I can’t help but believe it has the capability of influencing the competitive horse world in a positive way.